Do Islamic beliefs conflict with American values? Hate crimes against Muslims have been on the rise in recent years. A string of attacks by Islamist extremists has terrorized the United States and Europe, and anti-Muslim rhetoric during the 2016 presidential campaign by then-candidate Donald Trump and some of his supporters has helped create an anti-Muslim climate in the United States. Polls indicate that Americans have growing concerns about Muslim values and Islamist extremism, although surveys show that U.S. Muslims are a diverse community with values generally in line with those of most Americans. The nation's 3.3 million Muslim population is expected to grow to 8 million by 2050, and Islam will have surpassed Judaism as America's largest non-Christian faith. But most Americans say they know little about Islam and haven't had much contact with Muslims. 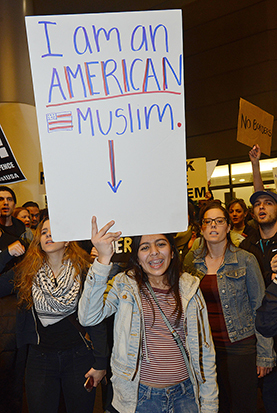 Meanwhile, protests have erupted over a temporary ban ordered by Trump on travelers from six predominantly Muslim countries, and anti-Muslim groups have staged rallies — met with counterprotests — alleging that Muslims want to impose Islamic law in the United States.